The newly redesigned TBS-100 case sealer machine is the heavy duty solution for a wide range of case sealing applications. The welded tubular steel fits a wide range of applications and is integrated with many Combi systems. This sealing machinery features extra heavy duty construction and oversized motors and drive components. 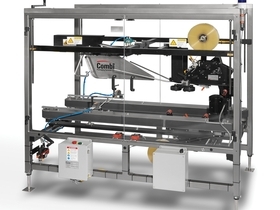 The TBS-100 is a modular system that is adaptable to many applications including top and / or bottom sealing, and many flap folding configurations. Available with tape or hot melt glue.